A full service photographic business located in the West End of Johnstown. The business, established in 1988, has been at its present location since 1992. Locally-owned, independent bank headquartered in Johnstown. Locally-owned, independent bank headquartered in Johnstown with several locations. design and manufacture of aluminum bodied freight, coal and other types of rail cars. Commercial, industrial and aerial photography as well as portraiture. Johnstown. Full service photographic business located in Johnstown, PA. The business, established in 1988, has been at its present location since 1992. A homestead raising Oberhasli and Nigerian Dwarf Dairy Goats. Located in Johnstown, Ohio, USA. Run For The Hills. Historical novel that tells the story of the Johnstown flood of 1889 as seen through the eyes of a twelve year old. The Candy Store has been in business since July, 1978. Since then over one million people have visited our little store. AA Meeting List for Cambria and Somerset Counties includes Johnstown, Somerset, Ebensburg, and Windber. By Johnstown Answering Service. 15 Richland Lanes Johnstown, Pennsylvania. Located in Johnstown. Pictures and links. Bowling center in Johnstown, Pennsylvania. 19 Planet Ice Johnstown, Pennsylvania. Johnstown, Pennsylvania. A state of the art family entertainment facility. Includes events, membership, and trips. Breeding straight Egyptian Arabian horses since 1991. In Johnstown. Panthers. Schedule with results, roster, coaches, statistics and news. 18 hole golf course. Site provides maps, prices, and outing information. Lady Panthers - official web site with news, schedule, roster, statistics. 27 Scouting Ireland (CSI) Dublin, 59th Johnstown/Killiney unit. Johnstown/Killiney unit. Includes section information, guestbook, event calendar, and contacts. Includes section information, guestbook, event calendar and contacts. International Association of Fire Fighters Local 463. Arabian horse training facility in Johnstown, Ohio. Located in Johnstown, Pennsylvania. Provides information about the services provided and resources. Official website of the Chiefs. 33 Searlwyn Stables Boarding facility. Boarding facility. 12x12 rubber matted stalls. Wash stall. 70 acres. Trail riding, arena, lessons. Grooming and training. Located in Johnstown, New York. Specializing in treating injuries and diseases that affect the shoulder, knee, hip and ankle joints as well as other joints of the body. Located in Johnstown and Ebensberg. 35 Richland Lanes Johnstown, Pennsylvania. 38 Planet Ice Johnstown, Pennsylvania. 48 Searlwyn Stables Boarding facility. 49 frank duca funeral home johnstown, pennsylvania. Staff directory, contact information, weekly event calendar. johnstown general practice firm, offering a wide range of legal services. Offers tour and cruise services to worldwide destinations. Includes package descriptions with itineraries and pricing. Displays information about the organizations board of directors, philosophy, and frequently asked questions. Also includes details about recent events and activities, membership conditions and contact details, along with a directory of links to other Jaycees communities. part of tida chapter 11, which is located in pennsylvania, johnstown area. SiteBook Johnstown City Portrait of Johnstown in Colorado. 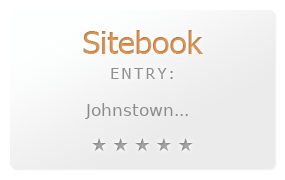 This Topic site Johnstown got a rating of 3 SiteBook.org Points according to the views of this profile site.